I only use my printer occasionally, and it’s even rarer that I’ll want to print on letterhead paper or on the reverse of an already-printed page, so I often forget which way the paper should go in! Fortunately most printers include one of the below icons embossed on or near the printer tray. The folded corner denotes the “top” of the page, i.e. 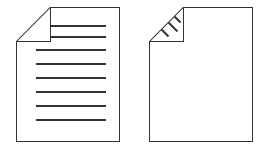 where the letterhead would go, and the lines show which side will be printed on, so you know whether to place the paper face-up or face-down. More details are in the post at Of Zen And Computing. This entry was posted in Hints & Tips and tagged orientation, paper, printer. Bookmark the permalink.